There’s a wannabe dictator in the Oval Office and answers don’t seem to be blowing in the wind. The dearth of the protest song is astonishing. Perhaps overwhelmed like the rest of us, perhaps needing more time to be inspired to sing about what many find so dispiriting, artists have, by and large, yet to directly address the Orange One in their music. Into the void steps one of the greatest musical titans of all-time, a living legend and one of the greatest lyricists of any genre. 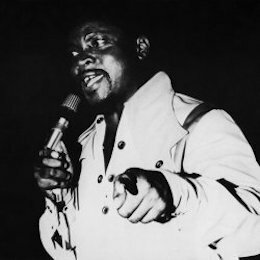 The Mighty Sparrow is one of, if not the, greatest calypsonians – a master with outsize influence on the genre of calypso as a whole and a favorite of people like Bob Dylan, who himself didn’t end up finding any answers in the ’60s, or beyond. Sparrow was always political. His career began, in earnest, with “Jean & Diana (Yankee’s Gone),” a song addressing the withdrawal of U.S. service members from his native Trinidad & Tobago over a decade after the end of the World War II. He championed the future-father of Trinidadian independence, Dr. Eric Williams (1957’s “William the Conqueror”) – and then blasted him the same year for the rising cost of goods (“No Doctor No”). He tackled the failed Caribbean Federation (“Federation [We Are One]”), where he upbraided Jamaica’s leaders for their jealousy at Port-of-Spain’s designation as capital. He commented on police-officer pay, on the lease given to the U.S. for a (new) military base – on the many topics that confronted a nation struggling for independence. This was all before 1960, before he’d even been on the scene for five years. Calypso itself was always political. As a genre, it was built on storytelling, and as a social phenomenon it served as news service, as rallying cry, and as a national identity. Calypsonians always wrote about politics, about colonial rule, about American forces in their land, about the dynamic cross-section of backgrounds found in Trinidad. Calypso and politics, both philosophically and practically, were intertwined since calypso’s invention. Unlike American protest music, however, its champion is still singing about politics. Sparrow’s fixation with Russia has been evident for exactly sixty-years. Starting in 1958 (“Russian Satellite” which, amongst other things, called out the death of dog/astronaut Laika), continuing with the Cuban Missile Crisis (“Kennedy & Khrushchev,” sample line: “Kennedy is a genius/ Khruschev playing robust/ Always talking tough/ Finally Kennedy called his bluff.”), and into today, Sparrow has looked towards the Bear with a weary eye since the earliest days of the Cold War. Trump is given the brunt of Sparrow’s lashings, and the singer sits firmly in the “believes there was collusion” camp. Few artists work “oligarchs” into their lyrics, but Sparrow does so numerous times, and few stones (including Roger) are left unturned. Reached by phone at his home in Queens, the blaring hum of two TVs glued to news-stations dins throughout the conversation – and makes its way into his world-view. “Money from Russia with Love” reveals much in its title, but the song is basically a liberal primer on all that’s awful about Trump, with references to Hillary Clinton, Robert Mueller, and Trump’s predecessor (“Anything Obama do, I’m gonna un-do, he can’t be more famous than me…” is, lyrically, a pretty good distillation of Trump’s thought process). But we’re not talking about just high-level rhyming or some easy digs: there’s a line pertaining to a spat during the 2017 G20 Summit involving Ivanka Trump sitting amongst world leaders, representing America. Sparrow’s watched all the news, internalized it, and put many peoples anger into song. Those in Trump’s orbit aren’t spared – “before you fire Mueller, you have to fire Jeff Sessions, or find another follower to do what violate all Constitution”. In a song about the Republicans approach to the Affordable Care Act (“Let Obamacare Implode”), Lisa Murkowski is called out for her follow-up votes after blocking a full repeal. Those who want war with North Korea are essentially dismissed as idiots (“North Korea”). These two songs start with the exact same four bars, but couldn’t feel more different (except they both mention Russian collusion in passing). No matter the song, Sparrow is always there with a few words of motivation, inspiration, or heaping dose of indignation. This level of specificity is what truly separates Sparrow from anyone else these days. Another song, “Redneck Property” takes us to Charlottesville, to Hurricane disaster relief, to Klan rallies and Robert E. Lee – and mentions a Southern Poverty Law Center report there being over 900 hate groups within the U.S.. The detail, and how much of it he crams into a single song, is astonishing; like a bridge between rap lyricism, The Daily Show, and the greatest Calypso legend. Musically, calypso hasn’t always translated to a non-Caribbean-American audience in the States. As Harry Belafonte brought it to the U.S., calypso was a form of big-band music, presented as exoticism. As one may recognize it today, calypso has transitioned out of being the domain of huge ensembles and into the studio, where the sound of steel drum has become “tinny” (this is true across much Caribbean music, and shouldn’t be taken as a knock where it might in other genres). This approach gives a sense of timelessness to modern calypso records – timeless in that they could have, interchangeably, been made in the 90s or today, as the sound hasn’t changed much in the interim. Fantastic article. Thank you for this a really fascinating read. I grew up with a family who’s dad was from Trinidad and they introduced me to the Mighty Sparrow from about the age of 11 and I was ever hooked on Calypso, Reggae and Mento from that point on.